IMPORTANT NOTICE: We originally, meant to share a short vision from the Lord to Brother Glenn regarding the eternal destiny of (his) Brother Glenn's mother who died during the month of August 2016. 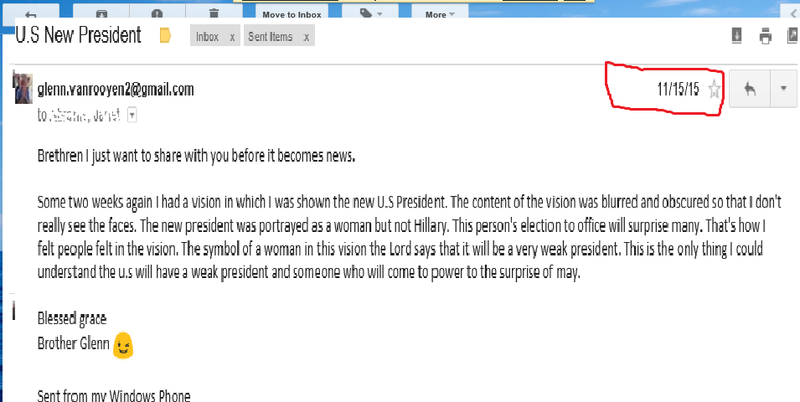 However, due to the equal importance of both pieces of information from the Lord, and since we promised during midweek that we would share regarding the Lord's choice of leader in the recent U.S elections, we would share that message (about Brother Glenn's mother) during next week's article, God willing! Fellow brethren in Christ, since we shared with the Lord’s permission in our last two articles about the U.S elections, it would only be fitting to reveal the full prophecy this week. Why we are sharing this is that there are people who were very critical of our visions and messages labelling us as false and as a ministry, we have a duty to defend our message so that the faith of the brethren may not be undermined (1 Peter 3:15-16). This vision was first revealed to me on the 1 November 2015. We have been reluctant to share the prophecy upfront as the Lord cautioned us not to draw attention to ourselves and that He would guide us on how to share this major prophecy. As a ministry, it is our humble intention to obey the Lord unconditionally in whichever way He directs us. While it is easy to make claims of prophecy fulfilment after the actual events took place, the Lord did guide and allowed us to share this prophecy with some close brethren from which you will be able to see the dates below. Indeed, Mr Trump's election did cause widespread surprise and shock around the world as you may have read on the newspapers and seen on television. This was the first original message that I shared with brethren on the 15 November 2015. This was the second message that I shared on the 8 October 2016. By this, we are not claiming or setting ourselves up as prophets, we are simple folk who are just grateful to share whatever message the Lord reveals to us with you. Additionally, the Lord did reveal to us that there are many Christians who doubt and undermines the prophetic messages of this ministry, and the Lord further encouraged us to be faithful as witnesses and only those who hears and recognises His voice will be attracted to the messages He gives through this ministry. The bible says, that if someone speaks or proclaims a prophetic word in the name of the Lord and if that word fails to be true, he or she did not hear from the Lord, but if it the word he or she proclaimed proved truthful and since the name of the Lord was associated with it, the Lord provided and gave fulfilment to that message (Deuteronomy 18:20-22; Isaiah 44:26). Now, being evident from this website, we have shared countless prophetic messages here with some messages being given in the form of a word of knowledge (1 Corinthians 12:8), (Supernatural Knowledge from God about demonic activities and revelations about people) and some messages being given in the form of a word of wisdom (Supernatural Knowledge from God about coming and future happenings). Thus, in humble obedience to the Lord Jesus Christ, our delight is to obey him do His will as according to His directives. From the vision itself, the Lord did not give us much information regarding the role of the new President and how he fits into God’s plan. There can be no doubt that Mr Trump fits into God’s plan and purposes since the Lord chose him for this hour (Romans 13:1-3; Daniel 2:21) and the Lord would not have revealed this to us and others. As a ministry, we would like to encourage our fellow brethren around the world to pray for the peace and safety of America and for its citizens to pray and submit to the authority of its leadership. Our approach to this matter is apolitical and our calling is just to share God’s message in whichever respect He chose to reveal it (Romans 12:6). We would also like to mention that since the Lord revealed this to us, He will not fail to reveal to us how the work of the new president unfolds in fulfilment of His (God’s) purpose. In addition, and with respect to Mr Trump, what we know is that the new president would be weak politically since he was dressed in woman attire in the vision. Biblically, woman are regarded as weaker than men physically (1 Peter 3:7) but equal to men in respect of salvation and leadership activities (Galatians 3:28; Judges 4:4-9). Also, we have no doubt that the new president will play a significant role in God’s end-time plan which we believe He would reveal as time unfolds. In conclusion, since this is a global ministry with readership around the world and most notably well received in the U.S we would like to encourage the brother’s hood to take of advantage of the grace period and let us pray for our individual Countries (1 Timothy 2:1-4) and proclaim the gospel message of peace (2 Timothy 4:2).